I realize that finger Jell-O is not necessarily rocket science to make — but if you’ve ever searched for a finger Jell-O recipe, you know there are a WHOLE bunch of different recipes that claim to be the simplest and/or the best. It’s crazy how something so simple could have SO many different variations! Anyway, when Nora FINALLY started eating solid foods around age 2, we stumbled upon some finger Jell-O at a Christmas party. She kept asking for it — and although I figured she would just gag on it and spit it out like everything else, she gobbled it up almost before I could pull my hand away. At the time, considering her extremely limited palate, I was literally shocked and immediately gave her another piece — and another. She just kept eating it (which was verging on miraculous at the time). When we got home from that party, I quickly Googled “Simple Finger Jell-O recipes” and came up with a slew of different options to try. Over the past year or so, I’ve tried a bunch of them — and THIS one is our absolute favorite. 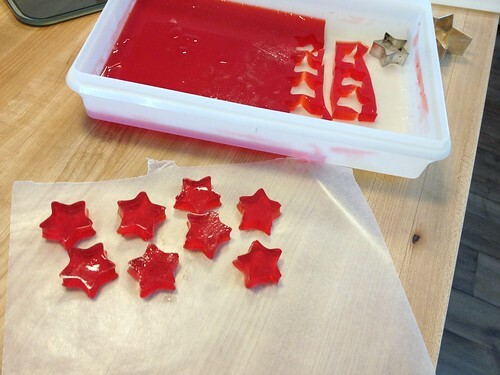 Not only is it super simple to make, it makes a big pan, it ALWAYS turns out, and it’s the “sturdiest” finger Jell-O I’ve come across — which is nice for making fun shapes or just being easy to cut. This is also a REALLY great recipe if you’re making any type of Jello shapes, Jello cubes, Jello “art”, or a Jello trifle salad where you mix pieces of colorful Jell-O with Cool Whip. 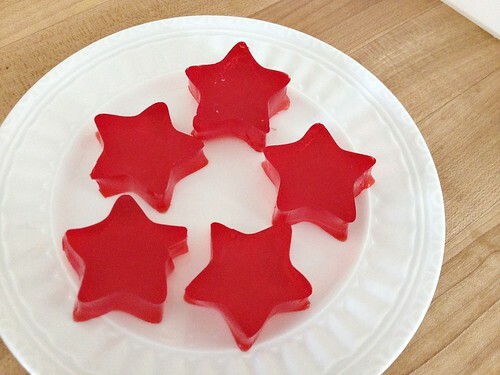 I fully realize that finger Jell-O might not be an “approved” food for many of the parents and grandparents reading this post — but I also know that a whole bunch of you probably feed it to your kiddos on a regular basis and might like to know our favorite recipe! And just because I’m so nice 🙂 here’s a recipe for Homemade Finger Jell-O That’s Actually Good For You! So, the next time you’re looking for a quick snack for the kiddos, whip up a batch of this finger Jell-O for a refreshing treat on a warm spring/summer afternoon. Do you have a favorite finger Jell-O recipe? This really turned out perfect. I had to make 2 batches for a supper at my son’s school, so this was great. 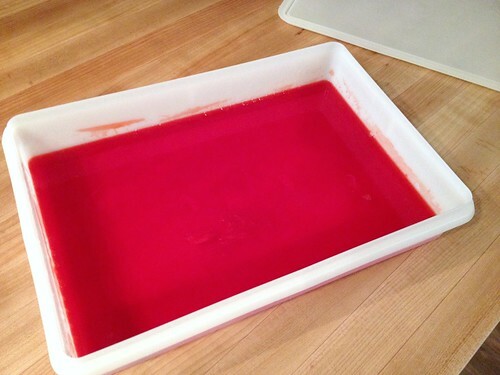 I’ve had trouble making finger jello before, so thanks very much for this recipe! yay! Glad you liked it! I make a batch almost every week around here! THANK YOU for sharing this post. I used to eat these when I was younger, but could never find a recipe that was just right. I don’t like regular jello, it’s too “soft” for my liking I guess, but Knox Blox (as we called them in CA) were always much heartier to eat. 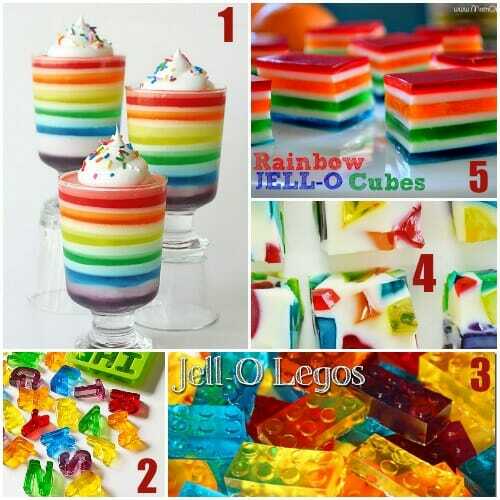 I bought some big boxes of Jello flavors at the store today, so going to give it a try making your recipe for my little guy. I think that this recipe might just hold together easier for him to eat as a finger food. He doesn’t like jello either, ha! Thank you again Andrea. Such a great recipe for us Mom’s. yay!! Hope you love this super simple recipe! This post couldn’t have come at a better time for me. In Australia – we just call Jell-o “Jelly” and it is traditionally a sweet wobbly dessert. My kids love it though I rarely make it. As it turns out I was making goodies for my DD7’s upcoming “Frozen” themed birthday party. Naturally I surfed the net for inspiration and noticed that lots of mums made “Sven Frozen Ice Blocks” being blocks of blue Jell-o. I figured US jelly must be different ’cause it sure looks firmer than it’s Aussie cousin. My trial run was just a wobbly mess. Then at 10pm last night – I reread your post. It had NEVER occurred to me to ADD more gelatine to the mixture. So I made a fresh batch last night and added some extra gelatine. I am pleased to say that the product in my fridge looks decidedly firmer than yesterday’s effort. 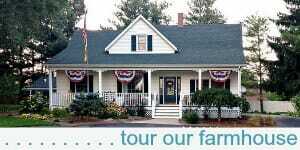 Thanks for a timely post ! 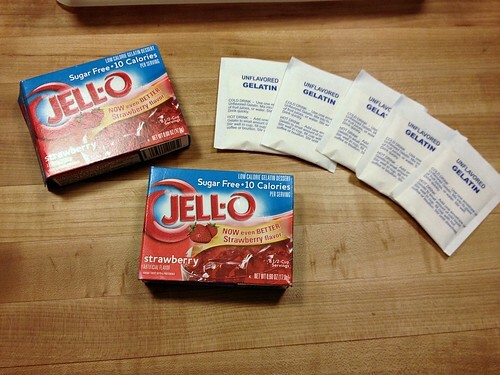 Have you made this with Regular Sugar Jello….I don’t like sugar free products(artificial sugar)? You’re so sweet to include a healthy version too. I would be more prone to make those as I have all the ingredients on hand. Still, those Jello versions are seriously nostalgic for me. My mom used to make Jello all the time served with cool whip. Two products I just don’t keep in my house anymore, but I might have to make a whole food version with the healthy recipe and some organic whipped cream. Because every kid should have memories of eating jiggly food. Right? When I started dating my husband, I was introduced to these. But his family calls them “Knox Blox”. His grandma only made them at Christmas. She literally made every flavor and every available container would be used for them, she made that many. 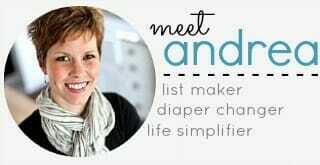 Yes, the name “Knox Blox” is because she used the Knox brand unflavored Gelatin. 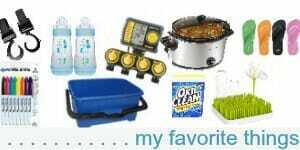 I just use Meijer brand because it’s a lot cheaper — but either way, it’s delicious 🙂 Although it sounds like that might have been a bit too much Jell-O for me!! Just jello you eat with your hands, so it’s sturdier than regular jello? That’s what makes them super thick and “sturdy”. They are SOOOO easy to cut and much easier for small hands to eat without making a huge mess! My toddler will eat nearly everything except jello! Funny how kids are so different. I make nearly the same recipe except I only use 3 or 4 plain gelatin. It’s still very sturdy and does not fall apart.